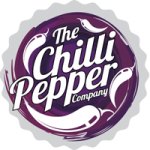 Gerald Fowler from The Chilli Pepper Company kindly sent me a box of goodies recently and in it was a bottle of 10 Minute Burn which contains Fresh Bhut Jolokia & Naga Viper Chillies and among other things 7.3 Million Scoville Extract. It has been banned from 4 chilli festivals for being too hot after it made people hallucinate and 1 person even had an “episode”. So the only place you can get it is from The Chilli Pepper Company website. It’s the antidote to bland food!